As the time goes by, sarongs are becoming a piece of garment that widely used by people around the world. 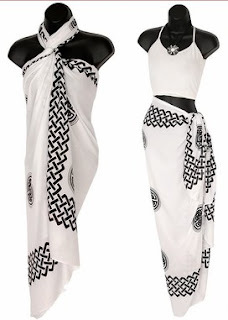 I notice that modern sarongs for women look more stylish and they come to you in different materials, colors, patterns and designs. I have several sarongs in my collection but I haven’t yet worn it as a clothing item. Occasionally I use it to cover my dining table and sofas in our living room. How’s about you? What do you do with your sarong collection? Last week I met a female friend at a restaurant when my husband and I were having dinner there. I admired her performance; she looked so elegant with her T-shirt and wrapped skirt. I recognized that she used a sarong to create the skirt but the way she tied the sarong make it looked so chic! Being curious, later I called her. I asked my friend how to create the skirt from sarong like she just worn. Aha, it turned out that she always uses sarong ties whenever she wears sarong as skirts and halter dress. She said that applying sarong ties is a practical way to wear sarong in style. I should also have these useful devices and start using my sarong collection in fashionable way! Hi. I am not used to Sarong. I am from south India. I haven't come across Sarong. But hope you start using your Sarong. Between your blog looks good. I have added your blog. I will be a regular visitor.